From left, golfers Doug Toole, George Angelo, Darrel Irvin, Deems Utzinger, Greg Hamilton and Larry Seip gather between the front nine and back nine of Yampa Valley Golf Course as part of the Cottonwood Classic. All of the athletes have played in the tournament 40 or more times, with Utzinger involved in the event for all 50 years. Some were there for its first year, others were decades away from being born, but they all came together this weekend for the Cottonwood Classic. The signature event for Yampa Valley Golf Course celebrated its 50th anniversary as 96 players hit the links of the Craig locale. Winning the overall event was Rifle’s Teig Hauer with a three-day total of 222 including a second-day 71. Tying for second place at 228 each were Cory Nolan and Cole Manuppella. Winning the first flight as well as the senior division was Roland Gauthier at 233, with Butch Behrman, Chuck Webb and Craig Madsen taking the second, third and fourth flights in gross score. Among the ranks was Craig’s own Deems Utzinger, who has not missed a Cottonwood yet and did not intend to stop his streak now. Five solid decades of swinging in the tournament began in 1968 when YVGC was still a nine-hole course and Utzinger was all of 21 years old, having spent much of his previous summers on the groundskeeping staff of the property. In that time, the game has changed, to say the least. “My game has, anyway,” he laughed. Utzinger has taken a slew of second-, third- and fourth-place honors over the years, though a win has always eluded him apart from a tie for first, which resulted in a playoff round loss. Though he has the most total Cottonwood tourneys under his belt and a perfect attendance record, Utzinger is quick to sing the praises of others who have turned out for multiple years, including compiling a chart of the winners since the inception, though a few holes remain. Many names appear repeatedly, including Steve Fry, who notched nine wins in the tourney ranging from 1974 to 1994. Also a recurring moniker is Greg Hamilton, who has won within his flight on seven occasions, playing in the Cottonwood this year for the 45th time. 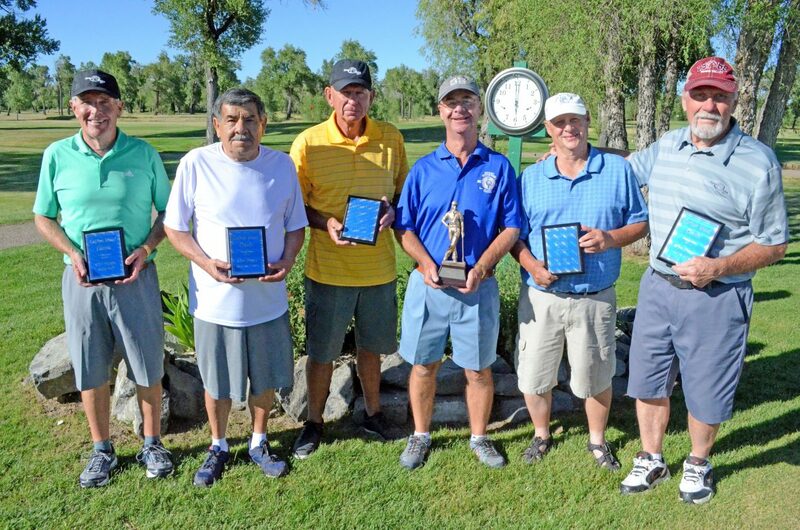 Utzinger received a trophy for his 50th tournament and those with 40-plus years also got a plaque, including Hamilton, George Angelo, Darrel Irvin, Larry Seip and Doug Toole. Other golfers in the field were playing YVGC for the very first time. Eagle’s Jud Shoup came up to Craig with a large group of friends who had previously played in the tournament and convinced him to join. “They said what a great time it was, so I didn’t want to miss out,” he said. Shoup said he had an excellent opening day but faced a challenge in one part of his game. Grand Junction’s Carson Kerr likewise noted the greens provided a worthy foe. “A lot of tough holes and pin placements,” he said after wrapping up his round Saturday. At 14, Kerr was the youngest in the field of golfers and played alongside the championship flight. Course professional Bob Mueller said a variety of ages was a boon to the tournament, which has to compete with many summer activities. A turnout of 96 is on the small side for Utzinger and Hamilton, who have seen well over 200 players in the Cottonwood’s biggest years. Nevertheless, the appeal of YVGC is what keeps them returning.